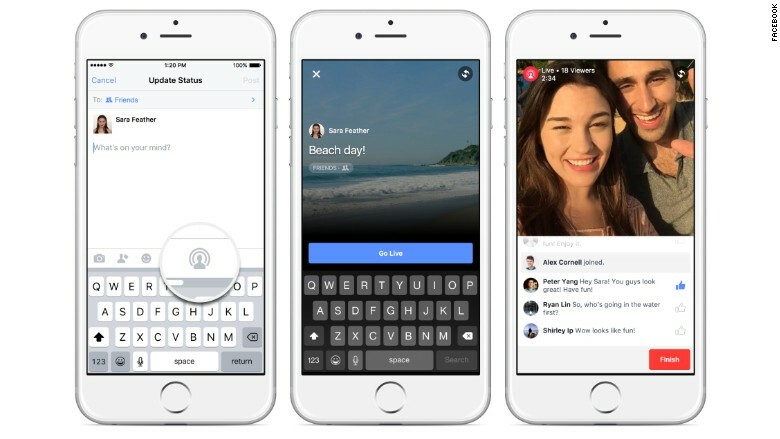 Facebook is adding a new feature that will let you share a live video stream with friends. A hike in the mountains, a baby's first steps, newsworthy events like a speech, or just a cat napping. Your audience will be able to watch it all in real time. The feature is almost exactly like Meerkat and Twitter's (TWTR) Periscope tool. The biggest difference is that the option is built into the main Facebook (FB) app instead of a standalone app, which should help it appeal to more users. And like all things Facebook, the default is to just share privately with your friends, though the settings can be changed. Earlier this year, Facebook tested the Live feature with celebrities. People like The Rock and Martha Stewart had access to the tool, but no mere mortals. Until now. The new feature is still in the early testing phase, meaning only a few lucky U.S. iPhone users will actually be able to try it out. Facebook did not say when it would roll out to a wider audience. Like Periscope, people can post comments during the broadcast and you can see how many fans are tuned in. Friends who missed a live broadcast can rewatch it on your Timeline. Those who find you especially compelling can even subscribe and get an alert next time you go live. Videos are huge for Facebook, which said earlier this year that users watch over 3 billion videos every day. Facebook is also adding a new collage feature that combines photos and videos from a location or day into one post. Collages will be available to iPhone users first and appear on Android next year. The social network has been known to add new features that already exist on other services. It adopted hashtags long after Twitter invented them. The popular On This Day feature is just like the Timehop app. Facebook is even testing a new Snapchat-like disappearing messages feature in Messenger. It tried to launch Poke, a standalone app that imitated Snapchat, but it has been largely forgotten.